When I posted my quiz on Raj Kapoor, the 'prize' for the winners of the quiz was a post on whatever they wanted me to write on. Winner Anupama sent me a request for a review of Kaala Patthar, which she believed deserved to be better known than it was. I had to haunt first runner-up Harvey to give me his request. He had correctly answered more than most people even attempted. He gave me choices. P.O. Box 999, Hum Sab Chor Hain or a post of songs - he even gave me a theme. Well, that theme was far too interesting to pass up, but I will need to do some serious research before I can post it. So I have filed it away for future reference. Thank you, Harvey. :) He was also kind enough to say that if I couldn't get my hands on either of these movies, I could surprise him with any post. Unfortunately, I couldn't get my hands on his first choice - P.O.Box 999. It had lovely songs, but I'm not too sure that the film was all that great. I have a vague recollection of having seen in the dark ages, but not enough to review it from memory. 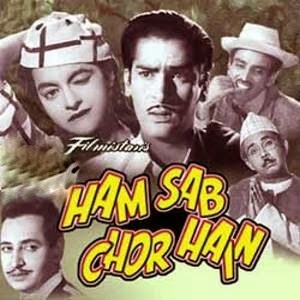 Hum Sab Chor Hain is a film that I not have seen before, but it was available on YouTube, and besides, it has Shammi Kapoor. I haven't watched a Shammi Kapoor film for ages, so this is as good an excuse as any. Harvey, this is for you, though I'm not too sure you will thank me for it. Budhram and Shudhram (IS Johar and Harold/Majnu [identified by dustedoff in the comments]) are conmen (and common thieves) who pose as social workers. Apart from picking pockets, which is their occupation du jour, they cunningly, and rather innovatively, flick food from the restaurant next door for their meals. They are visited by a private investigator, who has known them in their previous avatars as Messrs. Khatkaram and Bhatkaram; he is enquiring about a girl who used to work with them - Vimala. The two thieves are reluctant to answer, but the private eye is no pushover. When he threatens to reveal their secret, they quickly tell him what they know - they had given an orphan girl named Vimala refuge, but she turned out to be a thief. And of course, bad actions have bad consequences - she was caught red-handed and jailed. The PI has no difficulty in parsing their statement - they committed the robbery, and she was framed. Vimala (Nalini Jaywant) is in jail. The CID inspector who is questioning her tells her they intend to free her, but they need to know something about Khatkaram and Bhatkaram. Of course they should free her, she tells the inspector; she is innocent! They are conmen, she says, who claimed to be sadhus. They had taken her in, as well. Under the guise of opening orphanages, hospitals and women's shelters, they had fleeced countless people, leaving her to face the music. Suddenly, Vimala is in the company of a rather dashing Shammi Kapoor. No, I don't know his name, and no, I have no idea how she came to be there, though it appears that he saved her. From what? From whom? No idea. (See my aside up there for the explanation for why I have no clue!) In any case, she is on the run from the police, but she is innocent. She must be hungry too? Yes, she is; she hasn't eaten for two days! So Shammi takes her to a rather palatial house (he is quite spiffily dressed as well), where he is quite taken by her innocence in asking him a) if he is a rogue as well and, b) to put on all the lights in the house before she steps in. After which, of course, she promptly forgets about being wary of him and tucks into food. So her statement about having been hungry for two days was probably true. But when he asks her who the people in the picture are ("Dakkan", in Bombay parlance! It is quite obvious it is meant to be the two of them. ), she confesses that it is of the two of them. Why? he asks. (He can't be that clueless, no? Well, apparently, he is!) Because she loves him, she says. Why? he asks. (Aaargh. But I can't help liking a heroine who is that forthright.) Every girl in the theatre, including the lead actress, loves him, she says. And she hates all of them. Poor Nath. He manages to handle the situation by saying that 'good' girls do not talk like that. Another jump later. There's some extremely graceful dancing going on, and Ameeta (one assumes she is the afore-mentioned lead actress) walks in. 'Madam', as she is referred to, has all the nakhras associated with a lead heroine. Of course everyone caters to her demands, much to Vimala's fury. So when asked if 'Madam's' voice is good, she promptly says, no, not at all. And then, proceeds to add insult to injury by claiming that if this is the way she sings, the theatre will soon shut down. 'Madam' demands Vimala's dismissal. Pran comes down a flight of stairs holding a baby. (Hospital? Hotel? Something.) He opens the doors only to find Vimala standing there. Does Kamala live here, she enquires. Pran is shell-shocked. She repeats her questions and Pran blanches, almost dropping the baby. Vimala rescues the baby and is cooing over it, when a doctor passes them and congratulates them on their baby. Vimala is perplexed, but Pran, having a smidgen of intelligence, covers up the lapse, and escorts Vimala (now holding the baby) up the stairs. (By this time, I discover Pran's name is Deepak.) And in case, you have not figured this out by this time, Johar hits you on the head with the fact that Pran/Deepak is the "VILLAIN". Deepak takes her up to a room (yup, hotel), and still leaving the baby with Vimala (Do I know why she is looking for Kamala? Nope. Not a clue. ), goes away, ostensibly to call 'Kamala Devi'. Instead, he goes down to the lobby and begs the manager (Do hotel managers attend to the front desk?) to call a doctor - his wife has periodic episodes of madness, he tells him. The manager and others in the lobby are all sympathetic as they wait with Deepak for the doctor to come. Meanwhile, Vimala, tired of waiting in the room with the baby comes down to the lobby to find out what is taking so long. Unwittingly, she validates the lies that Deepak has been saying - that she is mad, that she doesn't recognise herself, much less that she is his wife, etc. By this time, Vimala, realising that no one believes her, is in a panic. To no avail. She is bundled off willy-nilly to the hospital and the doctor opines that it would be better for her to spend a few days in a mental hospital. Deepak, of course, is all agreement. (The scene jumps again. Perhaps I should just say SJA from now on?) Vimala is being dragged into the asylum where she protests vociferously. Again, no one really listens to her, and she is locked up. Days have passed and one day, back in the mental hospital, Vimala has spotted an escape route. She escapes (How? No idea.) and lands back in Nath's house, where Nath, theatre shut down (Why? No idea. ), is in dire straits. But Madame Fifi (So *that* is Ameeta's name! Sounds more like the name of a French poodle.) has come to visit, and if she sees Vimala there, she will commit murder. Nath begs Vimala to make herself scarce, but she manages to wangle a promise that he will give her a job. Clever girl. She also shows off her histrionic talents, infuriating Madame Fifi. Vimala soon makes her way to a deserted railway carriage where she can spend the night. Only, the train is not destined to remain deserted. She is woken up in the morning by passengers complaining to the police about her. Not surprisingly she is arrested for ticketless travel. Luckily (or unluckily?) for her, they run into Shudhram and Budhram who are now two bawas (Parsi gentlemen). They claim she is their sister and the havaldar, after a stern warning, lets Vimala go with them. As conversation ensues between them, it is clear that the two conmen know of all that has happened to her. (Why, how, what - are questions that the missing sections of film may or may not provide.) Their con jobs worked very well when she was their partner; now they want her back. She escapes from there by pretending to be mad. (Warning: SJA) A wealthy man's car breaks down in front of the railway station and grumpily, he decides to travel by train. Unfortunately, he leaves his wallet behind, and with only change in his pocket, is forced to travel third class. When he finally seats himself, torn and dishevelled, he runs into Vimala, who for some reason known only to her (and perhaps us, if the scenes weren't so badly cut) is pretending to hold a baby. Her co-passenger is shocked to hear the baby's name (it is his, by the way). Munhphat that she is, Vimala manages to not only tell him all about where she works (All India Theatres), but also to discover that the man had two daughters who were lost in childhood. (A-ha! Regular Hindi film goers will at once know what is happening.) She is full of sympathy for the old man, and assures him that, with god's grace, he will get his daughters back again. (Warning: SJA) Sethji is very impressed with Vimala. He summons Nath and his manager over, and says he is willing to continue to bankroll the theatre (he is a financier), only if Nath will give Vimala a raise. Nath is willing to promise him anything. But he has not contended with Madame Fifi, who knowing nothing of the wheels within wheels, is furious to find Vimala back on the theatre precincts, and is prepared to take matters into her own hands to ensure her departure. Matter do not proceed quite as Madame Fifi would have wished. Especially when Nath comes back to tell her that Vimala is going to be the new lead of All India Theatres. (Warning: SJA) Madame Fifi now bumps into Messrs. De Costa and De Souza. Yup, our old sadhu/samaj sevak/Parsi gentlemen. Only, she is more than a match for them. Very soon, the three of them are as thick as, well, thieves, and are picking their next victim - Seth Dhirajmal Shantidas. He is the financier who is backing All India Theatres, and Madame Fifi has her eye on killing two birds with a single stone. Messrs. De Costa and De Souza (or Kalidas and Tulsidas, or so they claim are their real names) are all for the heist. The next segment opens with the two conmen (I've given up on how many previous identities/disguises they have/had.) in jail. In the women's wing. They are now Madam Khadki and Madam Bhadki. Why does the hero have less to do in the film than the heroine and the two comedians? (Poor Shammi, and poor us!) More importantly, which idiot decided it would be a good idea to upload a film cutting off all the songs (except for O Mr Banjo)? And important scenes? And most importantly, where will I now find a complete copy of this film?! Harvey, may I kill you? Please? This was Rajendranath's debut film as a comic sidekick and he is not as annoying here as he became in later years. This was also the film where Shammi first met Mohammed Rafi, who had playbacked for him earlier. This is a film I would definitely like to see in its entirety. It was pretty interesting masala film, and I think, would have been rather entertaining if only it had been complete. For one, Shammi looked gorgeous, mouche and all. He doesn't have much to do but look handsome, but he does that very well indeed. Dashingly, devastatingly, handsome. Nalini Jaywant, pretty as a picture, whom I have not liked much in the movies that I have seen of her, is fantabulous in this film. The film rests on her petite shoulders and she does a great job of anchoring it. I think I will go see if I can find some older movies of hers. Harvey, I apologise for this farcical review and will make it up to you, I promise, with a post on the theme you sent me. But if you really, really like me, you will find an uncut version of this film and send me the link. To be fair, though, I remember having seen this film in its entirety years ago on Doordarshan. Though I don't recall it too well, I do remember this much, that it wasn't so very choppy and disjointed; my main grouse back then was that Shammi had a moochh which I didn't like! If it had been as totally incomprehensible as it seems in its Youtube avatar, I'm sure that would have stuck with me. And yes, one song I used to like particularly was a nice stage song with Shammi and Ameeta, on a 'train station' built onto the stage. It was a good song, though I've forgotten both lyrics and music. IS Johar's buddy is Harold; his screen name was Majnu. Appeared with IS Johar as a team in a number of films in the early 50s, including Ek Thi Ladki. Yes, another beautiful song. We are lucky indeed. You could do both, Madhu. :) Laugh and cry, I mean. I know I did. I'm pretty sure that if I had seen the film in its entirety, I would have enjoyed it quite a bit. I did like Nalini Jaywant's character a lot. The only two people who irritated me where IS Johar and his buddy. Because it was so totally unnecessary. Thanks for identifying him. p.s. Do you think Harvey will like me any more? You are welcome, Harvey. But not for this: I had even tried watching it once, but I. S. Johar got on my nerves. what happens. How could you, Harvey? I thought you liked me? A pity you didn't take a screenshot of it. True! What an opportunity I missed! Next time, Harvey! Harvey, Harvey, you will run afoul of the Bajrang Dal! "So *that* is Ameeta's name!" Of course not! Ameeta is the villain/vamp, Harvey! I thought I made that very clear! "And who is the mysterious woman who a doctor has saved from drowning?" You didn't tell us anything about this before. Ah. See. Now you have to watch the movie! (Actually, if you watch the YouTube version, I bet you won't be any the wiser for it! Though it is very polite of you to ask, no, you may not. Oh. *Sad puppy eyes* C'mon, Harvey; it's such a teeny-tiny thing that I'm asking of you! And so politely too. Fantastic review. Loved it and will read it quite often. "You are welcome, Harvey. But not for this:"
"How could you, Harvey? I thought you liked me?" Of course, I do! I still don't understand how you can even doubt it? I like you more than I can say. "Harvey, you will run afoul of the Bajrang Dal"
Why? Bajrang Dal doesn't like the idea of Sita throwing fish? Why shouldn't see? Maybe she was propagating vegetarianism. My Hindi film upbringing tells me if Madame Fifi is Ameeta then Vimala and Kamala must be sisters, both played by Nalini Jaywant. and "the mysterious woman who a doctor has saved from drowning?" can only be their mother. "I will go forever not knowing what happened where, when, and how and to whom... :("
The only possible way must be to buy the DVD. But on my last trip to India, I couldn't find any. Considering the wringer Harvey put you through, he'd better still like you! What d'you mean by 'Why not?' Heck, you began watching it, got irritated with IS Johar - and you wanted met to watch it instead?! *Morosely* They probably haven't seen the entire film either. and Kamala must be sisters, both played by Nalini Jaywant. Wah, Harvey! You have definitely studied your Hindi phillums very well. "the mysterious woman who a doctor has saved from drowning?" can only be their mother. Wait, I take that earlier statement back! Laughing so much at ...she must be propagating vegetarianism. Now that you mention it, she did look like she was throwing fishes down in that picture! *grin* True. But the cheek of that boy! He couldn't watch it himself because he found IS Johar irritating, so he decided to make me watch it! I don't think he likes me at all actually. I don't know which is better - your review or the dialog between you and Harvey! Unfortunately, I can't laugh because that will set off another bout of coughing! But I will give you one piece of advice - watch out the next time Harvey asks you to do a review! As the majority concurs here,watching (with all due respect to) I.S.Johar in a lead role must be an ordeal, though I like some of his performances in films such as Johnny Mera Naam etc. There are people out there, who like I. S. Johar just like there are people out there, who like Raj Kapoor. Milord, the evidence is in his own words on this very page. There's a court scene? When? Where? Aaargh. Now I really have to find an intact print of this film. :( IS Johar in the lead role - yeah, it looked like that. Poor Shammi and poor us, as I mentioned in the review. DIsqus was acting up again, yesterday. :( I know. They were having problems with their widget for Blogger previously, but yesterday, the whole site was shut down for maintenance. Well, I was just mentioning varying tastes of mankind. But now that you mention Raj and I.S. in the same vein. It does sound true. Swords or guns? arre baap re. kabhi bhi dono chalaye nahin. The only gun, which I can chalao is the one we used at Diwali for 'tikli', but even that I hated since it made so much noise. If you demand satisfaction, I demand more variety of weapons. Poor Lalita! Leela Chitnis ki tarah khaansi ka rog. Hai! Obviously, both my Hindi and my poetic abilities need work; but then, my husband is the one who writes 'pomes' in the house. still in Lanka gazing at the sea. She was throwing her jewelry so Rama could follow. defeat Ravana, add a string to his bow. Why on earth would she call Ayodhya home? Sadu, I hold you and Harvey responsible for this bout of coughing and here's a word of warning - should something ghastly happen to me as a result, and the police come investigating, both of you will be named as responsible parties in my final note. The Commonwealth of Massachusetts decrees that a citizen of the Commonwealth cannot be legally charged for "pomicide". So there. @Lalitha: Arre, usse baksh do, yaar. Who will make tea for me on weekends? Lalitha, usse baksh do, yaar. Who will make tea for me on weekends? Yeah... but do you know your periodicals from your chronicles from your dime novels from your autobiographical spectacles.? For lovingly saying "Get Well Soon" I'm banished from Jairam kitchen! no, she always lived to bless the newly married couple and be harassed by the new bahu. Amusing 'pome' and great as usual! How do you do that, Sadu? But a bit sad, no? Well, I never said that Sita didn't threw her jewels, when being kidnapped by Ravana. supposedly to lead Ram to Ravana. But it si possible that she started throwing fishes, when she didn't have any jewellery left and she started throwing down the sardines, which she had taken along as 'tiffin' for the long journey. But maybe she was throwing er jewellery away because Ravana promised her better ones. arre mera ghusa uspe kyun nikaal rahi ho? Banished from the Warrier kitchen as well. tum ghusse me aur bhi hassen lagti ho! I'm regretting my errant ways already. You did your job very well, Sadu! I'll spend my life from now on singing paeans of praise of Anu's review writing abilities and praise her heroic (or is it heroinic) effort to look at I. S. Johar films right in the eye and see right through! Do you think Sadu, that you can help me? Laughing out loud at the idea of Sita taking 'tiffin' along while she is being abducted. D'you think Ravana allowed her to do that? Or he bought it for her on the way? God save me if you and Sadu get together! Poor you, Lalitha, still coughing? I'm definitely going to look at any film he asks me to review very closely, Lalitha. I'm very, very suspicious of him. An abducted bharatiya nari does not carry tiffin. are poor Ravana's ill gotten riches. Let this be a lesson to you Harvey. Let us remember the two chicks in Parvarish. okay, I'll stop abducting daughters of Bhoomidevi. Didn't know there were many. BTW, why are you referring to Raj Kapoor and Mehmood as chicks. They were in drag in that movie. Mehmood in drag doesn't surprise me at all, but Raj? That sounds very plausible! With divine grounding as well! A wise lady always has something to nibble at in her handbag. I thought you were a wise lady yourself and you don't know this basic rule? Sadu IS clever, isn't he? Leela Chitnis never got the opportunity to write a parting note, not even in Awara. But somehow I gather you don't like this metaphor much. Harvey, that banishment was for saying "Leela Chitnis ki tarah khaansi ka rog!" She never seemed to recover in any movie, and I am beginning to feel the same way! God save all of us if Harvey and Sadu get together! Well, you don't make tea for me, so you can suffer! And since, as Harvey says, Sita was vegetarian, she had to throw the Sushi out. :) :) Very well done! Yeah, that's the feeling I got as well. And somehow I can't shake off the idea that the killing part would be, though satisfying for Lalitha, immensely painful for me. I don't speak the Franceman language Sadu, at least it looks like that. But calling Parveen (btw it is Shabana, I think) fillies is a bit going far, isn't it? I mean, they don't bear any similarities to the horse-family. Except you mean their health, of course. Neetu particularly, looks very healthy there. In my teens I considered this great stuff. Now I still like the music but the lyrics don't hold the same thrill as they once did. "Let me find you a filly for your proud stallion seed, to keep the old line going ... etc etc"
No, I'll tell her to make it as painless as possible. bas? Na, na, thik ho jayega! are you drinking ginger tea? "Let me find you a filly for your proud stallion seed, to keep the old line going ... etc etc"
Yes, Harvey, all line clear. :) And Johnny Walker to boot - what more could I ask for? I was away so could not keep up with all you prolific bloggers. Well what do I say?Quite a review I might say, what with you not being able to see the complete film, I got a good idea of what the film was though, the usual entertaining masala films, the type we watch, enjoy in parts and soon forget it. Long ago I had seen Italian Job, the Michael Caine film not the latest film. I had a similar experience. Those days after an English film had had its run in the city, it was later released in the suburbs. There used to be this old cinema hall New Talkies, it was later renovated but at that time it was in a terrible shape and the by the time the English films were screened here they were in as bad a shape as the cinema hall. Italian Job was sniped off liberally and what is more I got the feeling that after snipping off the scenes, someone had decided to juggle up the entire film so much so that I could make head nor tail of what the film was all about. I was as frustrated as you were watching this one. No this hall was a decent one,in that respect, those days if you wanted to see an English film, you had go to the city, in the suburbs there were just a few cinema halls like this New Talkies in Bandra. Later it was renovated and started screening Hindi films as well. Now it has new avtaar,it is even more plush and is called Globus. Mukeshji was indeed the greatest singer of his time with his inimitable style and soulful voice & superb rendition. Hear ' jhoomti chali Hawa ' & 'mujhe raat din ye Khayal hai' to appreciate that he could excel singing such high pitched songs with finesse.it was upto the Music Directors to extract the best out of him.His popularity can be gauged by the Fact that 94% of the songs sung by him were hits. This feat has not been achieved by any other singer. He sang in all moods whether fast paced like 'Awara Hun','Jap jap jap re','Dam dam diva diga'' romantic ones' Dekhti hi raho Aam darpan na yum','Chandan sa bad an','ibt da e Isha mein ham',sad ones 'chal ri Saini ab kya so he','Mere toote hue dil se','Bahaaron ne meta Chaman loot Kat', philosophical ones,'saman re jhoot mat bolo', 'Oh re taal mile nadi ke jal mein','Aasmaan pe hai Khurda'etc., to name a few incomparably. Eh, if you read my post, you would know that I definitely don't consider Mukesh the 'greatest singer of his time'. But I do like quite a few of Mukesh' songs, as my trilogy of posts on him show. Actually, I'd rather not get into the comparison game at all, and instead, be happy that we had a number of great artistes who have left behind a wealth of melodies for us to enjoy. I respect your view but still am a votary of Mukesh for his mesmerizing melodius singing.His voice was God gifted. And I respect yours, Arvind. I still love a whole lot of songs that were sung by him, and that is why I say that I hate getting into the comparison game of 'the best' singer. I certainly do not consider him any less worthy than any of his peers. He has rightfully made his place among the pantheon of great singers from the golden period.